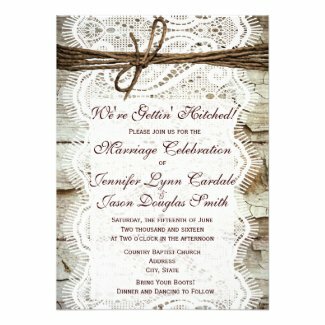 Today's new design is a distressed and rustic looking barn wood and lace wedding invitation. The lace and twine bow are just printed designs, not actual lace or twine. 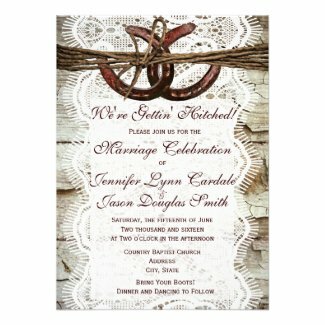 The backside of the invitation also has the distressed wood grain print in full color. These are great for barn weddings and any country style wedding. They would even be an option for someone who is looking for a camo wedding invitations for a hunting theme but doesn't want to go for an all out camouflage design. Here's also another version more for a country western affair. This one reads "We're Gettin' Hitched" and at the bottom it says "Bring Your Boots". These are great for barn weddings and country western weddings. There are version with or without two intertwined horseshoes at the top of the announcement. Matching RSVP cards are also available. These are shown in the BASIC paper type, which is a smooth finish (and looks a bit shiny). For a more elegant wedding invitation I would choose the LINEN or COLUMNED paper type in the white color. I love these initiations! How do I find out how much they are? Just click on the picture and it will take you to the order page. Price is based on the number you order and the paper type you select. Order 100+ invites and receive 40% off. How much for 250 invitations? They are 45% OFF when you order 250. The base price for the BASIC paper normally is $1.95, but with the 45% OFF discount they are $1.07. You can upgrade to more premium paper or to rounded corners also. Prices are subject to change.